A couple of years ago Jon, staff and the children at Evesham Nursery School discovered the fabulous sport of clay skating. 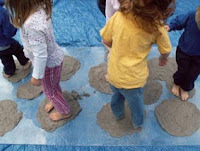 Originally the large sheets of perspex on the floor were designed for painting slip and arranging clay coils onto – then the children took it upon themselves to develop the activity into a full body clay/slip experience. They slid, squelched and rolled around on the stuff. The only drawback occurred in the clean up operation – for half an hour of activity there was approximately one and a half hours of de-claying and scrubbing the children clean. Everybody was keen to repeat the experience but the next time outside, bare foot, and on a nice sunny day. Well we didn’t get too many of those last year so it was a whole 24 months later that clay skating made a welcome return to Evesham Nursery. 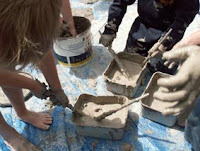 Once changed into old clothes and socks, and shoes firmly to the side, the children enjoyed clay in the most physical way imaginable…They started off by jumping up and down en mass to flatten soft clay lumps onto the perspex. Then water via paintbrushes was introduced to make things a little more fluid!